Bald since 1995, Micky Boyd, baldcaster, looks at the hairstyles he would’ve loved to have had that genetics cruelly denied him. All 13 episodes of the podcast, produced by me, can be found on Twitter and the Facebook page. Here’s a taster from Micky’s BalDcASt series. Ep 12 sees Micky eulogise Roger Daltrey’s hair over the last half century. You’ll note they’re very short shows. Micky, as his fans will recall, is a busy man. With my website renewing for another year later this month, if you enjoy my radio and podcast work, please consider making a donation via the Paypal link on the homepage here or by clicking on the Paypal link below. All donations, large or small, will go into paying for the annual renewal and keeping 500+ shows and videos, spanning a decade, online. 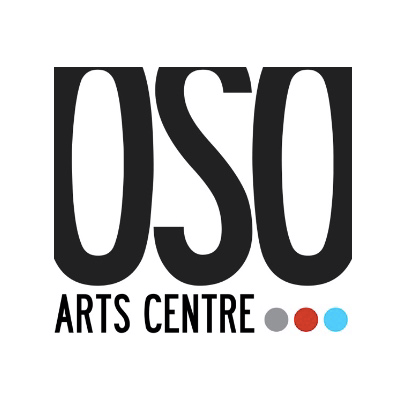 My new short comedy play, a two-hander entitled ‘The Meal’, debuts at the OSO Theatre on 16 April as part of its latest DISPATCHES: Scratch Writing Night. There are seven plays in all and the night kicks off at 8pm. Here’s a link to an article that appeared today on the UK’s biggest comedy website, Chortle, about 12 hidden comedy gems from the Resonance FM archive. I’m pleased to write my most recent work for Resonance, The Café Chronicles, is listed in the 12. You can of course find the complete 10-part first series of the show on this website as well as the hour-long Christmas Eve special. Just a quick post to wish all listeners and readers a Merry Christmas. Those of you who have kindly donated to the site during 2018, a special thank you. I have taken the time to thank every donor individually responding to email addresses I have for them. On occasion, the email addresses I have haven’t tallied with the email addresses the donations came from and I apologise if any donor hasn’t had a response. Airing on Christmas Eve, 8pm on Resonance 104.4fm. 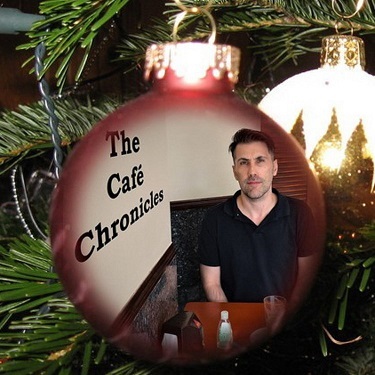 As mentioned on this week’s guest appearance on Bibi Does Soho, I will be presenting a special hour-long festive edition of The Café Chronicles next month. 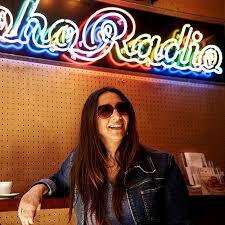 The Café Chronicles Bumper Christmas Annual will air on Resonance 104.4FM on Christmas Eve at 8pm. The show is likely to feature many of the characters that featured on the opening 10-part series that aired on Resonance back in the summer. All the episodes are available to download both from this site and also Apple Podcasts. It’s looking like my eBook Me! Me! Me! is finally going to be in print next year. I’ll have more details shortly once it’s confirmed with the publishers. This will mean a relaunch for the title and it’s likely to disappear from Amazon soon until it’s published in print, at which point it will again be available as an eBook. In Latest News Tags Me! Me! Me! I caught up with the great lost UK podcaster earlier today, Micky Boyd. With the café undergoing its refit and not reopening until Sunday (a partial glimpse of the work last night has left me anxious my favourite corner spot has been done away with), Micky and I went to one of his regular haunts. The coffee there was too strong for me (as indeed it was the last time we went there) and my old friend, looking very trim, quickly spotted my bad coffee face. While my range of facial expressions are severely limited, the one thing my features can produce is a bad coffee face. And this was bad coffee. We hadn’t seen each other since the summer when I was on crutches and Micky was kindly driving me around. After a couple of days spent trying to explain to my aunt Spanish Kanu, who ‘officially’ turns 80 next week, what asbestos is and why workmen are descending on her block to remove said asbestos, it was good to catch up with Micky. We chatted about our shared love of Sherlock Holmes, my 79-year-old uncle being fist bumped by his fellow horse racing fans in the local bookies, and the fragility of the Sainsbury’s own cracker which breaks up at the slightest contact. There is no real point to this particular post. Micky was just keen to have this picture of him up on the website and I was unable to come up with a more interesting post to justify posting this picture of the mid-eighties school sprint champion. 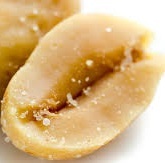 A peanut had taken my regular table in a cafe. Not my cafe, you understand. But I had the sense in this dream that this was a regular dream cafe and as is my habit stretching right back to childhood when I had to sit in the same corner of the room during my music classes at Primary school (much to my teacher's chagrin), I had a favourite table in there. I was taken aback to find the peanut sat at my table. I couldn't be sure whether the peanut was looking right through me. In front of them was a broadsheet. I caught sight of a headline. Thrown by the peanut's presence, and unable to settle for sitting anywhere else in the cafe, I left. But I kept circling the cafe to check if the peanut was still sat at my table. I must've looked a dozen times. The peanut showed no signs of leaving. Was the peanut waiting for someone? Was it, I wondered, waiting for me? I stepped back into the cafe and disappeared into its gents downstairs in the basement, where I found myself being sick. Still, I had enough about me not to touch the toilet bowl when being sick, as you see people doing in films. Sure, I was thrown by the peanut's presence at my table, but I still had the presence of mind to make no contact with the bowl as I was sick. I sorted myself out, splashing water on my face before heading back upstairs to check on the table. The peanut was still there. I didn't want to leave the cafe again. I made my way cautiously to 'my' table. I looked at the peanut. The peanut looked at me. We looked at one another for what seemed like an eternity and with great sadness. And then the peanut rose from its chair and left the cafe. I sat down at the table. I looked at the newspaper. I’m pleased to confirm that I am now represented for my books by KTLA. I was interviewed about my work by writer MS. Karamat for Vogue Italia . The Café Chronicles, my new 10-part radio comedy series starts on Monday 6 August at 10am on Resonance 104.4FM (repeated at 6:30pm) and runs every weekday until Friday 17 August. Daniel Ruiz Tizon returns with a brand new series, presenting 10 x 5 daily missives from the South Lambeth Portuguese café he has holed himself up in since the summer of 2001. As the gentrification sweeping through Nine Elms and Vauxhall accelerates, The Café Chronicles documents the characters and community threatened by these changes. The salmon-coloured socks of a laughs-too-easily customer leads to a troubling, long-suppressed recollection for Daniel. From Monday 6 August at 10am, repeated at 6:30pm, and running every weekday until Friday 17 August, I'll be presenting daily 5-minute missives from the South Lambeth Portuguese café I've holed myself up in since the summer of 2001. As the gentrification sweeping through Nine Elms and Vauxhall accelerates, The Café Chronicles documents the characters and community threatened by these changes. It’s a world of tobacco, discarded chicken bones, faded denim, easily slighted personalities, exaggerated Mediterranean gesticulations and coffee, the glue that holds the old community together and you can hear the 10-part series only on Resonance 104.4 FM. The show's 10 episodes will also be repeated as a 50-minute Omnibus edition at 10am on Sunday 19 August. If you enjoy my work, please consider making a secure donation via Paypal to help keep this archive of 500+ radio and podcast shows online. You can do so by clicking on the button below. Our little-heard host finally reaches the magical 200 mark on his one-time favourite day of the year. Featuring Channel Christmas, the once-a-year-only imaginary festive channel and a special appearance from 'The Kid'. In the second of three shows this Christmas week (and the penultimate episode of the series), our little-heard still under-the-weather host struggles through a torrid 21 minutes. In the first of three shows this Christmas week, our little-heard under-the-weather host looks at new businesses opening up on South Lambeth Road and recalls a long forgotten memory from the café.